It was one wet night in February 2009, we were all in a common area of Loji Gandrung in Solo, the official home of the mayor of Solo, a colonial remnants, build in 1792. That night we were all there to launch a newly formed Solo Blogger Community called Bengawan. There was about 40 bloggers from Solo, Yogyakarta and Jakarta attending the event. It was raining before, and the air brought in a calm and serene atmosphere, warmed by conversations and friendships. The mayor, who we were not expecting to show, was there to greet and have dinner with all of us. He supported and applaud that Solo now have a blogger community, and he told us how all of you hold a strategic tool, our blogs, to spread a positive messages about Solo and about the country. That is the power of persuasion, I remember myself thinking and that Mayor of Solo is 2009 was Jokowi. 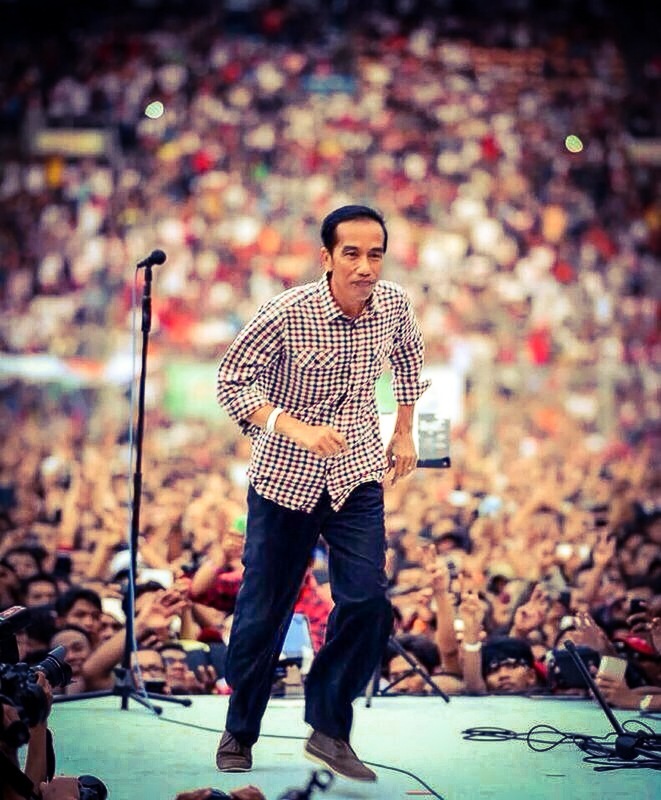 Fast forward just 5 years from that moment, today in 2014, Jokowi faced and is doing a life changing campaign as Indonesian presidential hopeful. Mind blowing to think that in that short moment how one life can change so much, but this remind me of how everyone life has change in that period of time too, thanks to social media, digital technology and how rapidly we see how these two things inspired changes in many fields and in the near future. I can’t help myself thinking on the similarity of Jokowi leadership style and the new paradigm of how globally people try to solve their own problems. Nowadays, in many cases, globally, instead of relying on one source of authority, or central government, people by using the tool on their hand, take charge of the problem and solve their problem locally. Called it the do it yourself (DIY) movement, the maker movement, the small pieces loosely joined, but time and time again this alternative way of solving problem proven to be more efficient and effective. Even in Indonesia, we have seen communities from Indonesia Berkebun in urban farming initiative to Akademi Berbagi in adult continuous education. From Suara Pemuda Anti Korupsi (Speak) to Buku Untuk Papua, all are movements, organized by volunteers, loosely coordinated but they are all real actions, taking on real problems. It’s ground up solution, instead of top down direction. It’s the power of attraction instead of coercion. It’s the power of ideas instead of the power of money. It does not command, it’s inspire. In other words it’s a movement, not barricade. In other words, that’s how I see the biggest strength in Jokowi’s arsenal, his soft power, his power of persuasion and get things done instead of relying on bureaucratic procedures that most of times slip into solutions that unfit and came too late to arena. Jokowi understood his role as leaders and head of state is not going to be the single source of power where all solution will derived from, he understood that what he needs to do is to orchestrate all the elements of government to work together to serve people better. To listen, to be there for the people and in the end to inspire the country, to lead us to a new age. Government need to be there to provide people with basic infrastructures and administration, create fair rules for business, uphold the law and protect citizens, and care for the weak that cannot defend themselves. But that is all. The dynamics of this new global age that we are all facing now are too complex to solved by the old way of command and conquer. Indonesia is too big and too dangerous to lead by a strong leader and we’ve tried that already for 32 years. A country as big and as diverse as Indonesia needs hundreds of leaders, thousands of thinkers and millions of doers, and we need to be coordinated well so we all know that we are all going to the same direction, Indonesia need to become a movement. We need a new paradigm of leader to bring all of us to the future. There is a famous essay, written in 1997 titled “The Cathedral and the Bazaar” by Eric S Raymond the father of open software movement. In the essay he compare how the two models work, at one there’s the big corporation propriety model where software development done by command, target and troops like single minded goal, the Cathedral, and on other side there’s The Bazaar, the open source movement where there are no ownership of the whole software because the software is own by no one and built by everyone. Everyone can volunteer to work on any part of the software that they like as long as whatever they are work on will be a part of the open software again. The Bazaar model inspired hundreds of developers and solve millions of problem in a fraction of the cost, and in the end it’s free for everyone to use. The Bazaar model was a movement and since then it has become the model of many successful projects from Wikipedia to Firefox, from Apache, most use web server in the world to MySQL, most use database server in the world. And even until now it has evolve to what is now called sharing economy model like Airbnb and Uber or Lyft, where we can all rent our unused rooms or cars. There are many criticism of how Jokowi run his campaign, from the lack of coordination to lack of single consistent message. In the other hands, there are many volunteer groups that work because they were inspired not because they were paid or commanded to. These volunteers group from Jokowi side are working alone and working together at the same time. They are producing comic books, images, quotable photos, facebook pages, twitter account, songs, video clips, mobile apps, music concerts by themselves, they are small pieces loosely joined, they have created a movement, they are The Bazaar. And this, by definition, is an open source campaign. There’s a bit chaotic feeling there, things move so fast, anxiety of having to let go of feeling in control, but that’s exactly the skills we need in this day and age. We need to have our principles deeply grounded in our believes but let go of having to be in control all the time and be more adaptive and flexible while taking on real problems and doing real action. Indonesia need new leadership style that firmly grounded in principles but agile enough to face and solve any kind of future challenges in this more and more complex and fast changing world. A leader that listen not command, a leader that inspire not instruct. Vote Jokowi, vote for the future.